Is becoming an entrepreneur on your list of New Year’s resolutions? 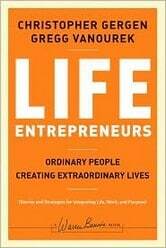 “Life Entrepreneurs,” a new book by Christopher Gergen and Gregg Vanourek, argues that the concept isn’t limited to your career – it’s about creating the complete life that you want. The book takes readers through a process of getting in touch with their core identity, creating their vision for their lives and making that vision a reality. It features interviews with 55 entrepreneurs from a variety of fields about how they created work that they love, that serves others and that aligns with their values. It’s all about an “electric attitude of what’s possible,” says Vanourek, who talked with us by phone last month. He is a founding partner of New Mountain Ventures, an entrepreneurial leadership development company. Gregg Vanourek: I think that for those people who are forced into a situation where they’ve lost their job security and it’s a tough hiring market, we could make the case that this is the time to be entrepreneurial. The book “Free Agent Nation” (by Daniel H. Pink) talks about this trend that’s already under way of more people being free agents and contractors and having the flexibility to move from project to project, company to company. All the principles and practices of entrepreneurship – being motivated, ambitious, resourceful, having a vision, taking action, taking risks – I think can be helpful for people who are put into this position by necessity so that you can keep your head above water. It could be a wonderful opportunity, surprisingly, for those people. Photo by John Wiley & Sons. Previous articleCan Twitter Be Useful For Biz?